I have been playing with propagation calculation software to predict propagation loss using different types of propagation. I found a nice tool build by G0MJW available from his website. It has several possibilities in using different types of obstacle data. 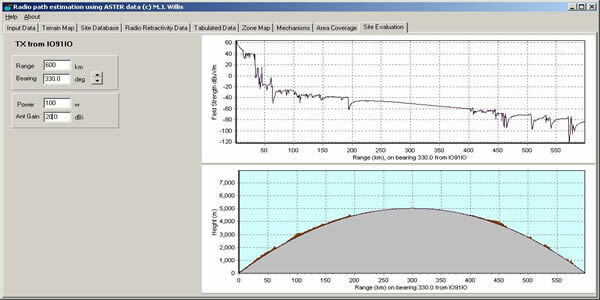 Especially for microwave contacts this tool gives the opportunity to simulate different trajectories and to see if contacts are possible. 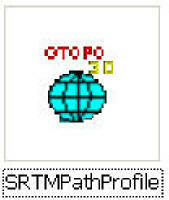 Also it gives reliable predictions for tropo scatter. However it does not work for Aircraft scatter propagation which I mostly use on 23 cm or rainscatter on 3 cm. The tool has more output's valuable for looking into it. I am using the version with height information SRTMP files, this is probably not the most accurate available, but it is good enough for my purpose. I already had downloaded the needed height data for Europe when I was using the Airscout programme for predicting Aircraft scatter. For using this data it's just needed tot tell this SRTMP software the location off the stored SRTMP files on your PC in use by Airscout. After downloading this tool you have to play with it to find how it works. This can be used for prediction for line off sight paths but it will also predict the losses involved for non line of sight paths. Most important outputs are the predicted Overall Path Loss. 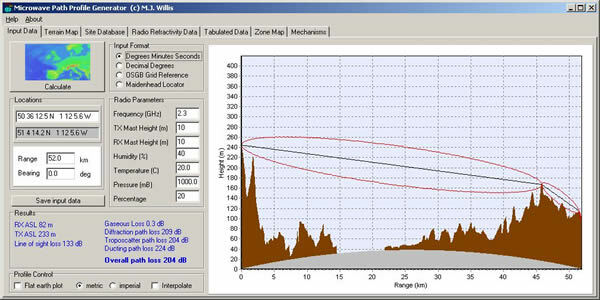 antenna gain both on transmit and receive and the overall receiver performance like noise figure, used bandwidth. and trying to find microwave trajectories for their experiments on the very high microwave bands.